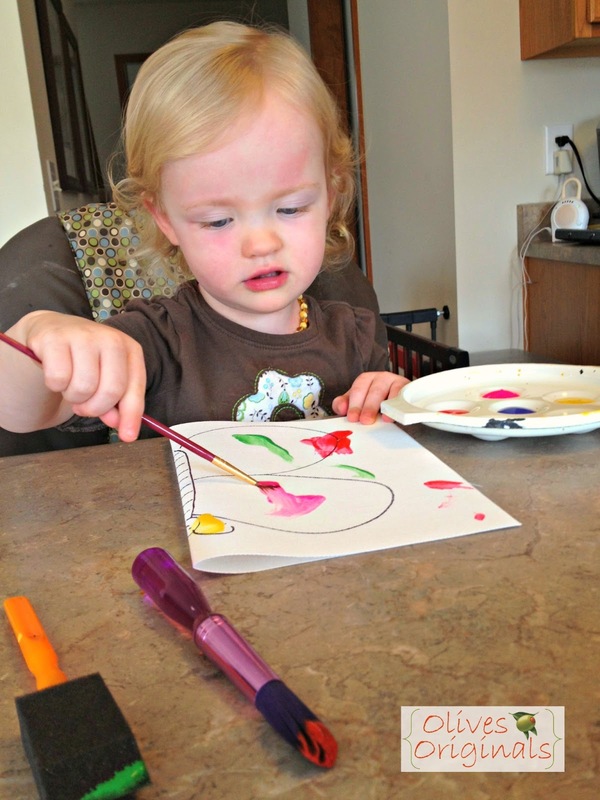 Little O just turned two last month, and I've started some homeschool projects with her. Nothing really organized or overly adventurous. I just want to help foster her natural curiosity and desire to learn about everything around her. We did some winter playdough, winter painting, and Valentine's Day playdough cookies earlier this year. Since Spring is in the air, I thought it would be fun to do a unit about this season. Then I was inspired by Shaunna over at Fantastic Fun and Learning to focus on butterflies during the next week. We started the week off by browsing our bookshelf and the library for butterfly-themed books. We read these books all throughout the week. I know there are other areas of math for toddlers besides counting. Sometimes I have a hard time coming up with what they are. However, with butterflies, it was easy. Symmetry. Butterflies are the same on both sides. 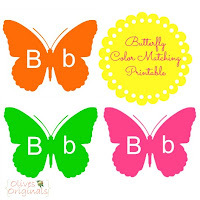 So, I created this Color Matching Butterfly Printable to help Little O learn about symmetry. I cut each butterfly in half, and her job was to match each side to its mate. I added the letters for use at a later time. I think she's still a bit too young for letter recognition. I also found these fun Butterfly Matching Cards from PreKinders. 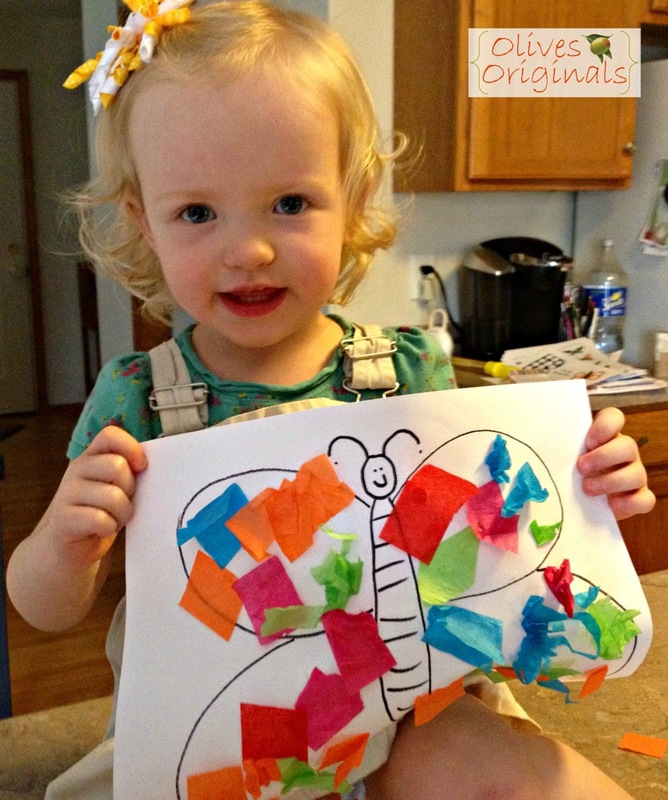 For Little O, we just matched a few of the butterflies to their twin. Down the road, we'll add more or even play a Memory Game with them. We took the idea of symmetry to our artwork this week. We made these Butterfly Blotter Prints. And, because Little O loves to craft, we had to add in just one more craft project! We took scraps of tissue paper (leftovers from random Christmas and birthday gifts throughout the years) and glued them to a picture of a butterfly. 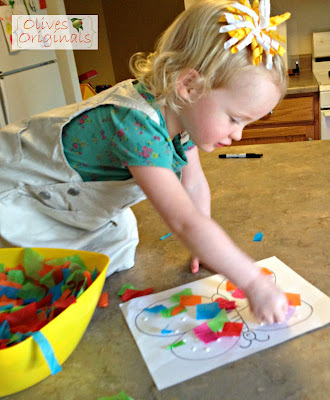 This project helped Little O work her fine motor skills, using her pincer grasp to pick up each piece of tissue paper. And she got to use glue for the first time. Fun! The obvious choice here would be to go on a butterfly hunt outside. However, it's still a bit cold for butterflies in our neck of the woods. I thought about planting seeds for a butterfly garden (and I still might), but I didn't think Little O would make the connections since it would take too long for the butterflies to actually show up. 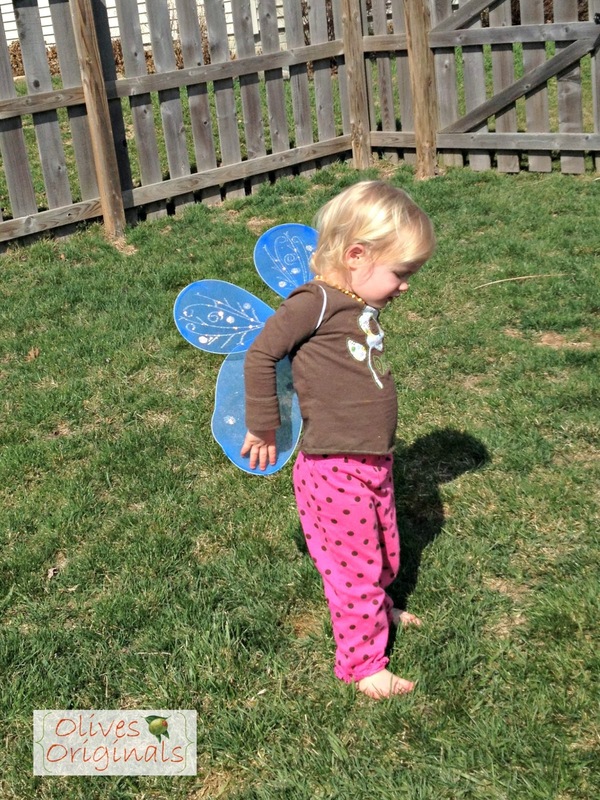 So instead, we put on some costume wings that I found at the Dollar Tree, and pretended to be butterflies flying around our backyard. Woohoo! Gross motor skills! We didn't get a chance to take a field trip up to the Peggy Notebaert Nature Museum to check out the Judy Istock Butterfly Haven. We're definitely going there in the next few weeks. (I had no idea it was there, and we get in FREE with our Children's Museum pass). I wish we could have made it there this week, but it just didn't work out. 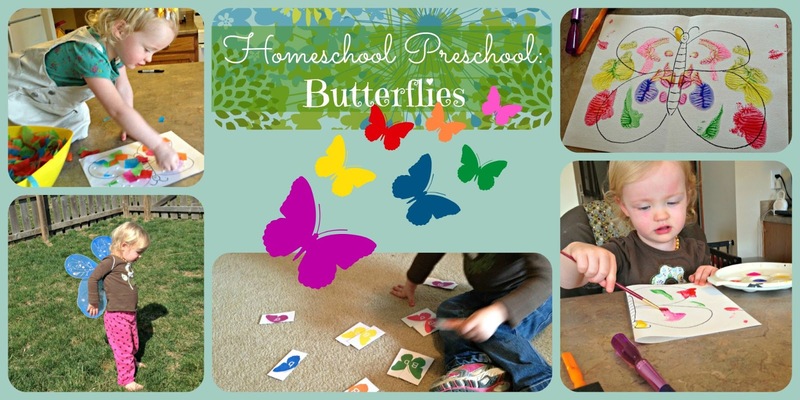 I hope you enjoyed our butterfly activities! I love comments, so please tell me what you think and what you're doing with your little one. Great idea! Thanks for sharing at True Aim! Super unit on butterflies! Love that you integrated some outdoor time also (so important to kids). Thanks again for linking up to Discover & Explore this week - I've pinned you to our feature board! Thank you! There were so many great ideas out there! Hi Jessica!! I love this darling little picture you did with your daughter!! I too, recently posted artwork I completed with my daughter!!! I have nominated you for a Liebster Award!! Please check out the details and reply and link back to me!! Have a Fabulous Weekend!! Thank you, I went ahead and updated my Liebster Award post with your questions. I'm so glad I could offer a bit of inspiration...you took it and ran with it! 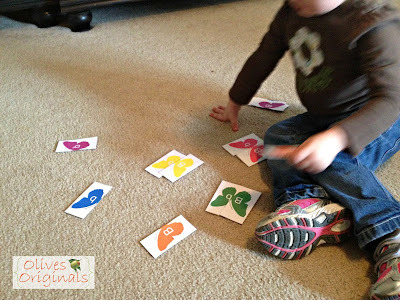 These are adorable activities, and it looks like Little O had a terrific time! Chuh! 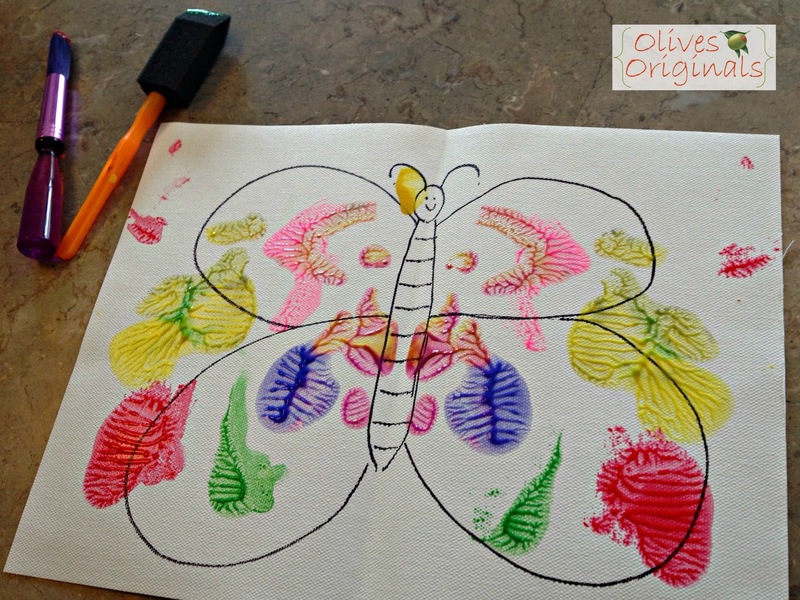 I love these butterfly ideas! Thanks for the free printable, too, that always makes a reader happy. Or me, anyway. I love how you made the top picture / collage do you mind sharing what program you used?